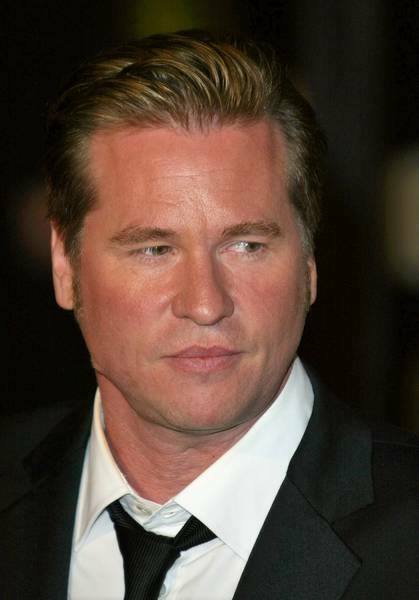 Val Kilmer is one of the most prolific actors of his generation. From his more recent work as a career military officer in David Mamet’s Spartan, back through his work with Oliver Stone in The Doors and Michael Mann in Heat, to his early work in Top Gun, Kilmer has worked with many of film’s most respected directors and actors. The youngest student ever admitted to the drama department at Juilliard, Kilmer made his feature debut in the comedy Top Secret!, which he followed up with Real Genius and his breakout role as the Iceman in Tony Scott’s Top Gun, opposite Tom Cruise. Other memorable roles include Jim Morrison in Oliver Stone’s The Doors, the title character in Batman Forever, Doc Holliday in Tombstone and Simon Templar in The Saint. His other starring roles include Michael Mann’s Heat, with Robert De Niro and Al Pacino;True Romance, directed by Tony Scott; Ron Howard’s Willow; At First Sight; and Thunderheart. Recent projects include the Ric Roman Waugh’s Felon, with Stephen Dorff; Déjà vu, an action-thriller produced by Jerry Bruckheimer Films for Touchstone Pictures in which Kilmer stars with Denzel Washington and Jim Caviezel; and Kiss, Kiss Bang, Bang, written and directed by Shane Black, and co-starring Robert Downey, Jr.; Millennium’s Bad Lieutenant, with Nicolas Cage and directed by Werner Herzog; Streets of Blood, with Sharon Stone and Curtis “50 Cent” Jackson; and Francis Ford Coppola’s Twixt Now and Sunrise. He won the 2003 Prism Award for his work in The Salton Sea, and appeared in the 3-D epic Wings of Courage, as well as voicing the characters of both God and Moses in the animated film The Prince of Egypt. Kilmer’s films also include Oliver Stone’s Alexander, Renny Harlin’s Mindhunters, the animated feature Delgo, Ron Howard’s The Missing and Wonderland. Kilmer most recently starred in MacGruber, a comedy based on the SNL spoof sketch of ‘MacGyver’. When Kilmer was at Juilliard, he co-wrote the play How it all Began, based on the true story of a West German radical. The play was directed by Des McAnuff and produced by Joseph Papp for the Public Theatre. He made his Broadway debut in the 1983 production of Slab Boys, with Sean Penn and Kevin Bacon. He also appeared in Papp’s Delacorte Theatre production of Henry IV: Part One, As You Like It, the title role of Hamlet and ‘Tis Pity She’s A Whore, also at Papp’s Public Theatre. Kilmer then starred in the Max Azria produced musical The Ten Commandments as Moses at the Kodak Theater in Los Angeles. In 2005, he starred on London’s West End at the Playhouse Theater in Andrew Rattenbury’s adaptation of The Postman Always Rings Twice as Frank Chambers, the drifter played by Jack Nicholson in the 1981 film version.